Just two days to go until Halloween. Somewhere demons are conspiring, spirits are stirring, witches are reading up on new dastardly spells, vampires are sharpening their teeth, zombies are groaning... you get the idea. Profile: In considering the psychology of Marc Bianco, it is important to understand from the outset that the events surrounding his case as we witness them are at least to some degree – and quite possibly in their entirety – an unreliable account, given they are narrated by Bianco himself whilst incarcerated in a penitentiary for the criminally insane. Nevertheless, that narration in itself tells us something about him. Undoubtedly, Marc Bianco is delusional. From the evidence we witness he very possibly suffers from Dissociative Identity Disorder, in which the subject displays multiple distinct identities or alter egos. Not only does Bianco immerse himself in his screen role as a ridiculous version of Frank Black, he also commits his killings in a series of otherwise irreconcilably diverse fashions. Such a diagnosis is normally linked to a major trauma or period of stress as a trigger originating earlier in life. We get no hint as to what this may be in Bianco’s case, but we certainly see evidence as to just how deep his psychosis penetrates as he rants to a room full of oblivious fellow inmates. A word or two on schizophrenia is merited at this juncture also, since this is a diagnosis to which the layman might leap. Schizophrenia is a much misunderstood and relatively common disorder in which cognitive and emotional responses to stimuli are misappropriated. Paranoid schizophrenics are the most common subgroup and hit headlines since when they do resort to violent crime their dysfunction allows them to commit the most appalling acts, but this is incredibly rare. It cannot be stressed enough that schizophrenics are very, very rarely homicidal – possibly even less so than non-sufferers of the condition – in spite of what a slew of horror genre material would have us believe. As Reverend Goodman cautions us, “Never believe anything you see on Halloween”. 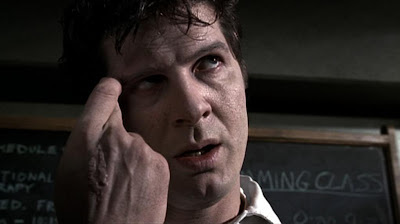 Another aspect of Bianco’s psychological make-up that marks him out is how he seeks to become Frank Black way above and beyond the demands of his starring role in an abysmal B-movie, to mimic him and his understanding of “what the killer sees” to the point of committing multiple murders himself. Bianco is so drawn to Frank’s ability to put himself into the killer’s head that he becomes lost to his delusions, and quite literally becomes capability, the thing we fear the most. It is perhaps a telling reminder of the toll that this line of work can take upon forensic psychologists, Frank Black included. 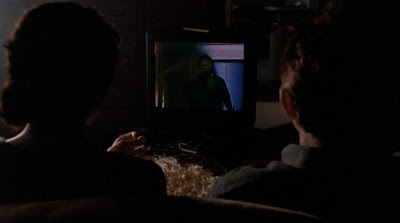 The other psychological effect that Marc Bianco forces us to examine is the purported effect of horror in the mediums of television and film on the perpetrators of violent crime. High profile examples include a murderer apparently motivated in turn by a book on barbaric murderers, a Zodiac killer copycat, any number of copycat killings attributed to the movie Natural Born Killers, a teenager who copied Dexter’s methodology in committing fratricide and, perhaps most chillingly similar to the case of Marc Bianco and also related in part to Dexter, the case of filmmaker Mark Andrew Twitchell. Whilst a media favourite topic, however, there is no empirical evidence to suggest a link between the consumption of horror and the committal of violent crime. Moreover, it is often the preoccupation by media outlets with such links that is seen by some to risk propagating them. The very attention given to serial and spree killers in particular often serves merely to portray them as people of power that can elevate them to be all but anti-heroes, whilst Millennium is normally far more effective at portraying its antagonists as violent, disturbed individuals who may even be the agents of some deeper rooted evil. And as a further editorial aside, the mediums of television and film surely teach and reinforce far more moral values than they do destroy them, even – and perhaps especially – when they are this dark in tone. Investigation: Quite frankly, it’s anybody’s guess as to exactly how the investigation into Marc Bianco went down. Frank Black and Emma Hollis’ state of perplexity at the unfolding set of murders exemplifies how hard it is to fit Marc Bianco into a neat psychological profile. They do, however, spend an inordinate amount of time over a bowl of popcorn profiling a variety of preposterous yet entertaining killers from the screen, and Frank’s insights here are priceless whilst adding a whole new take on how the genre represents murderers and their motives. Just something to think about when you’re devouring your horror fare of choice this Halloween. 2 Responses to "Halloween Week: Friday - What the Killer Sees: Marc Bianco"
I forgot to say I was waiting for this all week!! Thanks, Joselyn - that's good to know! Hope you enjoyed it - it was certainly a fun one to write.